Built around the globally-recognised Silverskin™ brand, our comprehensive range of reflective, thermally-insulated pallet covers is another part of the Softbox jigsaw that helps guard temperature-sensitive products against every conceivable eventuality in the transportation process. Apart from providing the protection you might expect from damage, dust, rain, moisture and contamination, our thermal covers slow down temperature exchange. They guard against short spikes that can threaten temperature integrity and product efficacy, often prevalent in loading and off-loading, cross docking and adverse warehouse conditions. 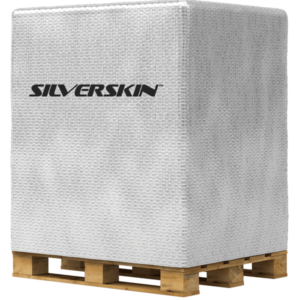 Silverskin™ insulated thermal covers allow more time for your products to move between risk points in the supply chain, permitting them to be transported or stored temporarily during logistical operations carried out in an uncontrolled temperature atmosphere. Manufactured from a range of protective insulation materials to suit performance and budget, our portfolio comprises single-use and re-usable covers that give high-performance thermal protection across all modes of transport. Each innovative solution is geared to align with GDP regulations, minimise environmental impact and reduce stock wastage. As pioneers in materials technology, we carefully select our solutions—whether you need one hour of protection or eight—to best serve your performance and logistical needs. Our experienced management teams assist with all the different thermal considerations inherent in load mass, product mass, packaging configuration, sunlight differentials, windchill and exposure. We can provide risk analysis supported by an extensive library of hot, cold and sunlight performance test data. And we’ll supply what you need via multiple local sites in the Americas, Europe Asia Pacific and Australia. Awarded the 2018 Queen’s Awards for Enterprise in the International Trade category, the Silverskin™ brand is used by many of the world’s leading pharmaceutical companies to maintain the integrity of their temperature-sensitive cargo in the supply chain. Manufactured from a blend of materials that suit all performance and budget requirements, the comprehensive Silverskin™ thermal pallet cover range is outdoor- and chamber-tested, and aligned to new GDP regulations. These covers are robust yet easy to use, offer superb insulation, enable protection against temperature spikes and reduce product wastage. Whatever your requirement, materials, thicknesses and sizes can be matched to different operational challenges.